For a limited time, receive a 16 ounce bottle of Wolfgang Pad Werks Pad Cleaner & Extender with your purchase of the Grit Guard Universal Pad Washer! A $14.99 value. The first pad washing system that works with ALL polishers! The Grit Guard Universal Pad Washer is the first and only pad washer that cleans all types of buffing pads on dual action and random orbital buffers. Clean foam pads, wool pads, buffing bonnets – you name it! The unique design of the Grit Guard Universal Pad Washer accommodates any dual action polisher to clean pads without even removing them from the machine! 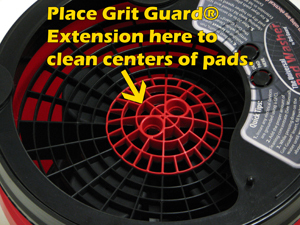 Unlike other pad washing systems, the Grit Guard Universal Pad Washer works with all polishers. The grid insert’s large diameter allows pads of all sizes to make contact, no matter how big the orbit. Even the Cyclo can be used with this pad washer! 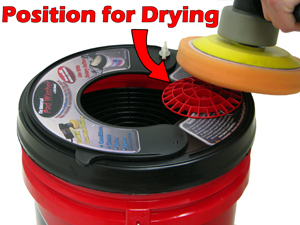 The opening of the pad washer is adjustable to accommodate any pad size and polisher. Clean pads on your Porter Cable 7424, FLEX XC 3401 VRG, and Meguiars G110. 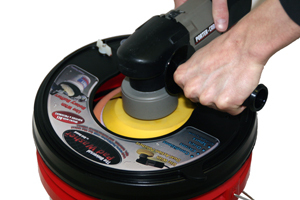 The Grit Guard Universal Pad Washer accommodates all dual action polishers. 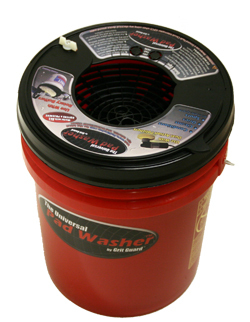 The Grit Guard Universal Pad Washer includes the pad washer complete with Splash Guard, the grid extension, a Gamma-Seal Lid, and a 4 oz. spray bottle of Pad Renewing Solution. The Pad Renewing Solution works with all types of pads and polishing balls. The biodegradable cleaner removes petroleum and water-based car care products from wool fibers and porous foam. Before using the Grit Guard Universal Pad Washer, spray the pad with 4-5 spritzes of Pad Renewing Solution. It will help break up oily residues inside the pad as you operate the pad washer. Fill with the appropriate level of water. Press down on the grid insert until the springs are fully compressed. Fill until the water level reaches just above the Insert. When you press down on the Girt Guard Insert with the polisher, the springs will pump water upwards to the pad. Always use the Grit Guard Universal Pad Washer with the polisher on its lowest setting for cleaning. You can use a slightly higher setting for drying.